The Sony Xperia Z features the new Exmor RS sensor and has the upper hand in pixel count with its 13MP sensor. 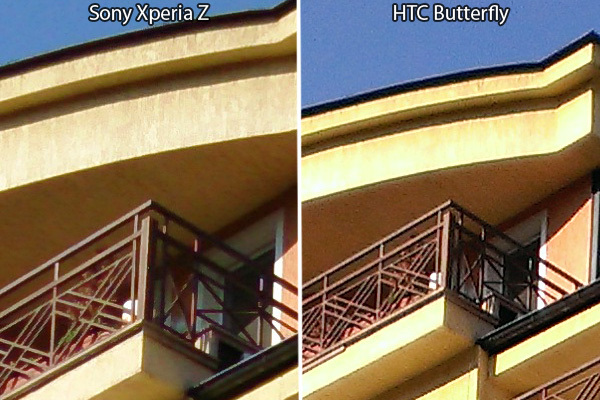 The HTC Butterfly compensates with a slightly wider-angle lens and a brighter f/2.0 lens compared to the f/2.2 of the Xperia Z. In theory this should let the HTC smartphone capture more light, which should result in slightly better low-light performance. 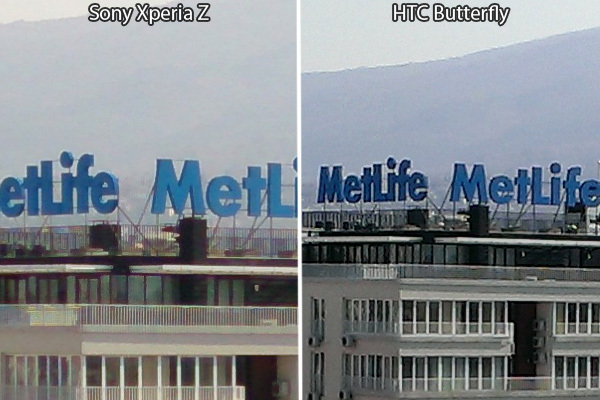 In order to compare the two devices on level footing we'll show the Xperia Z 13 MP samples compared with a native 8 MP photo from the HTC Butterfly and an upscaled version so you can easily judge the amount of resolved detail on each sample. 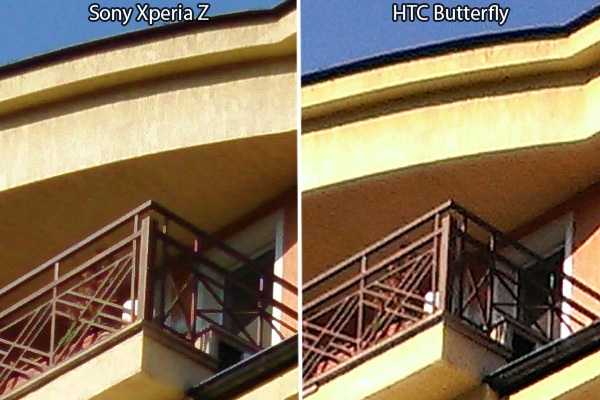 HTC's image processing algorithms have always been very aggressive and the Butterfly is no exception. The over-processed images with oversaturated colors and lots of traces of oversharpening looks good when downsized to the native resolution of a computer monitor, but lack in per-pixel detail when zoomed in. Sony's default approach is a more conservative one - the Xperia Z produces more natural images, that might lack the punch when downsampled, but have more detail and room for post processing. The good news is that if you favor the HTC approach better you can enable the superior auto mode, which usually produces similar punchier images. 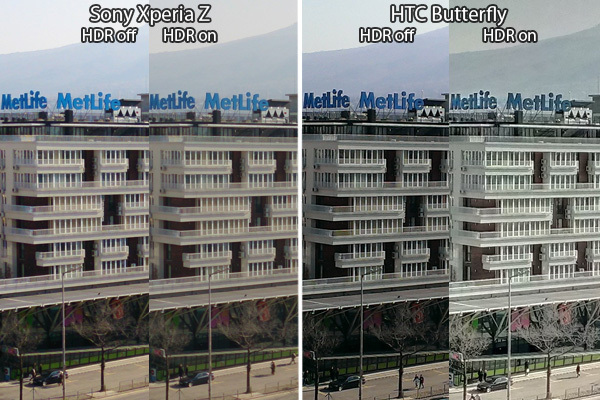 Looking at the first pair of crops you'll immediately notice the Sony Xperia Z's superiority in terms of dynamic range and color reproduction. The Butterfly is over-sharpening everything, which makes its image look sharper, but it actually has about the same amount of detail as the Sony shot. 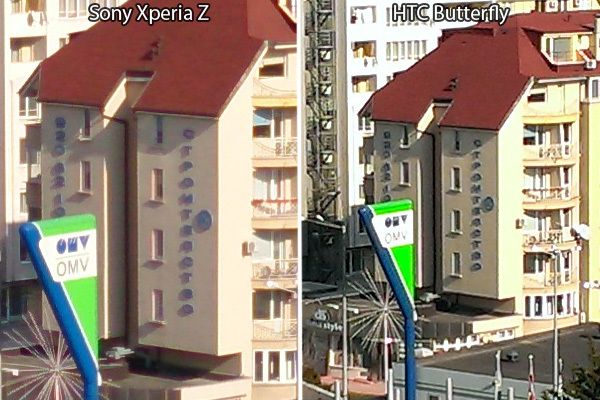 You can notice that more easily when you compare the Sony Xperia Z sample with an upsized version of the Butterfly photo. The fences on the terraces are much better defined on the Xperia Z photo. You can also spot the noise advantage that the Sony smartphone has over its competitor here. 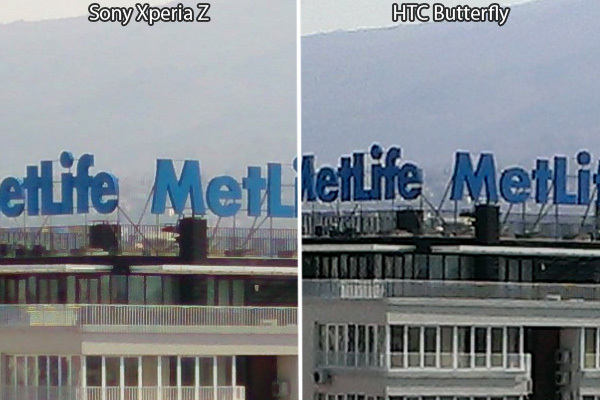 Moving on to the second pair of samples, we see more of the same - the Sony Xperia Z image has less noise, better dynamic range and way more accurate colors than the Butterfly sample. Up-scaling makes things even more evident, and lets you spot the different amount of noise on the two samples more easily. Finally we've picked a shot that shows the difference between a 13MP and a 8MP clearly. As you can see the Xperia Z handles the fence at the top of the building better and the individual bars are easy to distinguish. The HTC Butterfly on the other hand fells victim to its aggressive noise reduction, which eradicates much of the (already scarce) fine detail. Again you can see that the Xperia Z produces truer colors and the Butterfly again had trouble with the blue color, making it darker and unrealistic. When it comes to high dynamic range both phones have a dedicated mode on tap, which captures two sets of exposures and combines them in a single image with a wider dynamic range. 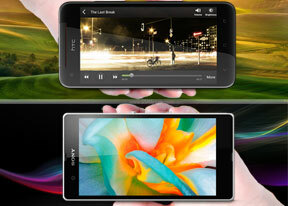 The Sony Xperia Z takes a more conservative approach and only adds a little extra dynamic, producing more natural images, while the HTC Butterfly goes for the exaggerated effect. Which one you prefer here is mostly a matter of personal preference. If you'd like a look for yourself here are the samples of both devices. We start you off with the ones captured in the default mode. And here are the full resolution HDR samples. We tested the Sony Xperia Z in its normal mode, but since we mentioned Superior Auto Mode we've also included samples of it in action. Here's our side by side comparison of the Sony Xperia Z and HTC Butterfly images captured in the controlled environment of our studio. Winner: Sony Xperia Z. 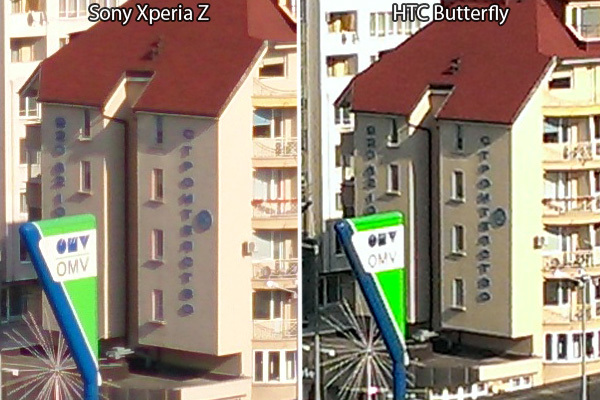 The Sony flagship has a clear advantage in terms of image quality over its competitor.